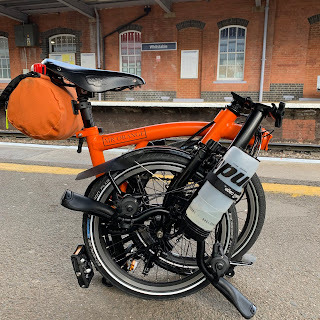 My Orange Brompton: The wait begins! Isn't it strange how when you are thinking of buying say a Vauxhall Corsa, you see lots and lots of Vauxhall Corsa's? Well in the early hours of this morning in the middle of the City of London when taking pictures of interesting buildings, what did I see? BROMPTON'S. The order as you know, if you reading this, was placed yesterday and I feel it will be a long wait. For the moment I have to make do with a Dahon Speed D7. Now many would love a Dahon Speed D7. For some a Dahon Speed D7 would be lovely and for them, they would surely wonder what I was moaning about? But it isn't a Brompton. Until it arrives I will have to be like Charlie Bucket standing on the outside of the sweetshop, watching Wonka Bars being sold.